Saul, still breathing murderous threats against the disciples of the Lord, went to the high priest and asked him for letters to the synagogues in Damascus, that, if he should find any men or women who belonged to the Way, he might bring them back to Jerusalem in chains. On his journey, as he was nearing Damascus, a light from the sky suddenly flashed around him. The men who were traveling with him stood speechless, for they heard the voice but could see no one. Saul got up from the ground, but when he opened his eyes he could see nothing; so they led him by the hand and brought him to Damascus. For three days he was unable to see, and he neither ate nor drank. Jesus who appeared to you on the way by which you came, that you may regain your sight and be filled with the Holy Spirit.” Immediately things like scales fell from his eyes and he regained his sight. He got up and was baptized, and when he had eaten, he recovered his strength. But Saul grew all the stronger and confounded the Jews who lived in Damascus, proving that this is the Christ. When you look at St. Paul, and at his letters, and his life, and missions, do you ever feel like saying, "Christ tagged the perfect man for the job when he tagged Saul -- obedient, really grasping God's plan." If you do feel that way, then you've got the wrong man! You're not talking about Saul. You're talking about the man who emerged from that incident on the road to Damascus, re-named Paul. Saul had all of reality defined: God, the Jews and Gentiles, the world, and the heretics following the teachings of Jesus of Nazareth. This man, Saul, was self-assured. Sallying forth, leading a holy crusade for God and the Law. Saul was sure about everything. Except for that memory haunting him: the look of peace and forgiveness on the face of Stephen the heretic, as he was stoned to death. That memory made Saul feel hungry inside. Saul saw Someone else in Stephen’s face, and heard Someone else speaking to him in Stephen’s voice. Saul was hungry -- for God. God was calling Saul’s name from eternity. But Saul kept feeding himself on empty definitions of God, instead of the true experience of God's love and mercy in Our Lord Jesus. When Saul experienced that vision of the Risen Jesus, and fell to the ground, it wasn't merely a physical tumble. Saul’s concepts of God, of himself, of judging, of salvation -- of everything -- were shattered by encountering and finally experiencing the one, true God in Jesus the Christ. But the fall to the ground wasn't the signal that Saul had been converted to Paul. Not yet! It was only the beginning of a process that would continue to convert Saul until his death. 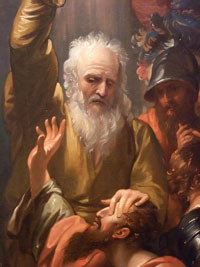 Saul-the-proud began that process of conversion by experiencing the humiliation of being led by the hand – like the humiliation of Christ being led to the cross. Saul stayed blind, with his reality shattered, for three days -- like Christ in the tomb -- until Ananias was sent by the Lord. Ananias led Saul out from his blind definitions, into the true light of Christ’s definitions of salvation and who will receive it. When "things like scales fell from his eyes," Saul’s personal scales of judgment also fell to the ground and shattered. Saul finally saw -- and accepted the reality-- that he was wrong about Jesus and about those who followed Jesus. 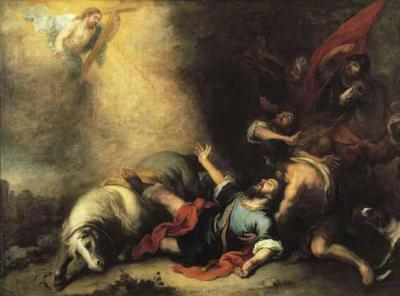 Saul’s conversion experience continued all his life. Somewhere along the line, Paul overtook Saul and remained. And then Paul, the new man in Christ, continued on that ongoing trip of conversion! Just because we attend Mass on Sundays or every day does not mean that we are fully converted to Christ. We are all, very much, like Saul. All of us have many parts of ourselves that still stubbornly resist God's call and stubbornly refuse to be converted. We’re blinded by our own lights. We all have our "absolutely-right-and-can't-be-wrong" definitions about God, Jesus, ourselves, and others. Have we fully experienced God -- or just our safe definitions of God and our calling ourselves by the demands we want to be called by? Jesus Christ converts us, we don't convert Jesus Christ. Jesus Christ defines us, we don't define Jesus Christ. Jesus Christ defines us to be His people on his terms, not on ours. So, it seems, you and I are like Saul in many ways. We still must be converted in so many ways. Thank God we have God's Words in Scripture. Thank God we have the Eucharist -- along with Saint Paul’s prayers to help us! Thank God that we have the graced opportunity, every day, to be like Ananias to each other, helping each other recover our sight, by allowing ourselves to be filled with the Holy Spirit and be continually converted. Ananias said, “Saul, my brother, regain your sight. ... Immediately things like scales fell from his eyes and he regained his sight. He got up and was baptized, and when he had eaten, he recovered his strength.” Ananias, in the Holy Spirit, led Saul to the truth about Our Lord Jesus and about the Jews and Gentiles following Our Lord Jesus. May the Eucharist we receive convert the murderous Saul within us, into the loving Paul -- by helping us see and accept Christ’s definition of who we are, and not our own.